Originally written as part of a course the author taught at Artfeast 2009, the material is now available to the masses. Ellsworth's art slightly resembles Tracy Moores Zetti style but is much more detailed and strange. The art is what makes this book; I really enjoyed perusing it and looking deep within. The book itself is a set of creative lessons to be done with the imagination mostly. Strange, unusual things and ways to think and create. The zine could be used as creativity starters for many forms of expression both visual and written. 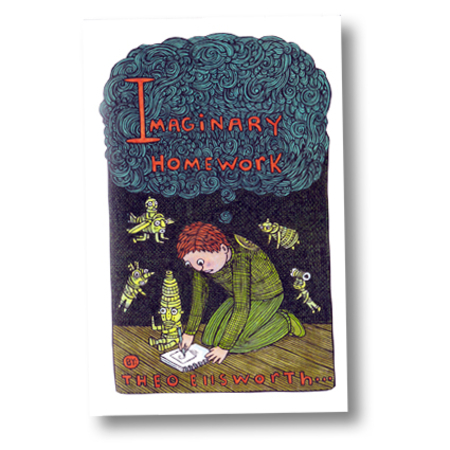 Theo Ellsworth has many other zines available on his website.